What do you need in a Crystal Reports Viewer? Not convinced yet? We invite you to test out Easy View for yourself on a free 30 day trial. We know you're going to love it. Easy can be used to run reports from Crystal Reports 2008 and older. Easy View has a Quick Launch screen that helps you access and run your reports quickly and easily. Easy View has a built-in report scheduler that can be used automatically run, export, print and email reports. Unlike some Crystal Reports Viewers, Easy View can connect to your data source and refresh the report. Virtually all databases are supported. Reports can be emailed directly from the Quick Launch window or automatically from the Report Scheduler. Save time running reports with Easy View's easy to use interface. Many common tasks can be completely automated. Run Crystal Reports without having to buy an expensive copy of Crystal Reports for each computer. Custom date variables that can be used to pass parameters to the reports from the scheduler. This lets you run the reports over and over without having to modify the schedule parameters. Easy View can be password protected to keep unauthorized people from viewing reports. 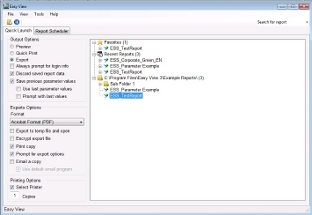 Integrate Easy View with other programs or schedulers with a command line interface. Easy View automatically keeps itself up to date with the latest features and patches. English and Spanish. More to be added. We are so confident in Easy View that support is included at no cost. What's new in Easy View version 3? Crystal Reports 2008 - Full support for Crystal Reports 2008 and older. The scheduler service is more fault tolerant. Even if there is a problem with a schedule other schedules will continue to run normally. It is now optional to send the exported file as an attachment. You can now include a link to the exported file in the email body. Option to not email a report if there isn't any data in the report. You can now embed HTML with graphs and images right into the body of an email. Many improvements to the Easy View interface. The directory function in the recent reports tree now searches all subdirectories for report files. Multiple values for each parameter now possible. Set parameter values by name or number. Unlimited parameters from the command line. Full control of export options for each export format. New Command Line Wizard - Completely new command line wizard that is simpler to use and gives you full access to all of the command line options. Report Encryption - Exported report files can be encrypted for extra security. You can use encryption with any export format. The files can be opened on any computer with Easy View or with our free decryption utility. Automatic Data Backup - Your Easy View data file is backed up automatically every time you make changes to a schedule. Supports multiple languages. English, Chinese (new), French, German, Portuguese and Spanish. Reports that use character based languages (Chinese etc.) are now supported. Barcode Scanners Support - Save time by using a bar code scanner to enter report parameter values. Improved Export Options Functionality - Improved support for export options for all export formats. Many More - There were hundreds of other improvements to Easy View. Contact the Sales Department for upgrade information.